I Am Glad You Did that! Over the past 24 hours a number of events have come to me leading me to ponder the contribution of community and house churches to wellbeing. “No,” she said, “You are one of only two people who have been in touch with me today. Last night our Home Study group met for its fortnightly gathering. We have been meeting for some 25 years and comprise members with religious orientation ranging from the deep Fundamentalist to the way out Progressive radical. Nevertheless we still find satisfaction in getting together. I met with a couple of Uniting Church ministers from neighbourhood churches. We revealed and accepted our doctrinal differences and in a frank and honest discussion were able to share in our passion that the Jesus way of unconditional love be proclaimed in our communities. A small column appeared in the Courier-Mail (page 20) of the June 15th 2018 issue. “Being actively religious could add more than six years to your life, a study suggests. Researchers believe the social aspect of a religious community could improve well-being, and said religious rules prohibited unhealthy behaviour and promoted positive activity among the faithful. One can argue about the statistical basis of this study but it raises the question. What is behind this?” Is it “God is being good to us, and never mind the heathen”? Or, has it something to do with the community and family-type responsibility which arises from groups gathering with a common religious purpose. Does community come before doctrine? I am inclined to think that in today’s 21st century environment it does. This is the ethos behind the Milpara concept of integration of congregations with their secular local communities and of the nurture of smaller sustainable groupings as house churches. Let’s see what we can do to respond to the loneliness which so many of us can feel in today’s busy world. This entry was posted in Uncategorized on June 16, 2018 by Coordinator. Carroll, James. Christ Actually: The Son of God for the Secular Age (p. 223). HarperCollins Publishers. Kindle Edition. This entry was posted in Uncategorized on May 17, 2018 by Coordinator. Especially for past visitors to this Milpara website. You will be aware that this website Milpara.com has been quiescent for several years. This is mainly because your editor has had other preoccupations. One of those developing preoccupations is a growing awareness that the current model for congregations with the mainstream church denominations is unsustainable. In early 2018, however, I became aware that other people may be seeing some merit in exploring an additional component. This would be something of a network of Christian groups meeting in private houses. They would be associated with a specific denomination but not tied to that denomination as a legal entity. So, although Milpara would continue to promote the “community” model of a church congregation as against a “doctrinal” model there may be virtue in stepping back from that primary structure – 50 to 100 worship attenders with one full-time minister. Instead we might generate a smaller more intimate “family” model of first contact with few if any administrative constraints. Of course, if the house church happened to grow (not its prime function) there may well be the opportunity to evolve into a standard congregation. So you will find for the time being with Milpara that we may be making a fresh emphasis on the “house church”. PS. On coming back to this website I have been reminded of the list of people to whom notice of postings is sent. If this is considered to be impertinent please let me know milparahouse@bigpond.com and we shall remove your name. On the other hand there may be some who would like to be added to the list. Invite them to send their details to us. This entry was posted in Uncategorized on May 9, 2018 by Coordinator. It is hard to believe that it is two years since we had a contribution to this Milpara website. It is not that I see its purpose as any less relevant but life has a way of making other activities a priority from time to time. While the nurturing of the integration of congregations with their local geographic communities remains a direction for Milpara I am coming round to putting more emphasis for the next 20 years on the facilitation of “house churches” which are seen as an option for the a future Uniting Church as described in Keith Suter’s Scenario Three – Return to the early church as small centres of “spiritual” focus. I am looking for young people with a 20-year vision to work with me on this venture. What prompted this specific entry, however, was following a link to on-line article in the Guardian newspaper by Giles Fraser. Mr Fraser notes that local churches are a hive of diversity. Indeed this is my experience going back to early childhood. It is this encompassing of a diverse community which impels me to promote the integration of congregations with their local geographic communities. Here is the first paragraph of Giles Fraser’s article. You can read the rest by following the link. This entry was posted in Uncategorized on December 29, 2017 by Coordinator. Milpara – A Suter-style Scenario No. 5? Milpara – Suter-Style Scenario No. 5? I would support the recommendation that people view the 2-minute vignettes by Keith Suter on his study of the future of the Uniting Church. He speaks very clearly and they are a good summary of his wake-up call to the Uniting Church. We have already screened the first of the video series, at one of our Acacia Ridge UC services. We may screen the others later this year. Suter’s commentary leads me to ponder where Milpara might fit in to all this. In thinking about these matters I wrote a little piece about where the concept (integrating congregation and local community) might fit into Suter’s scenarios. I came up with a Suter-type scenario No. 5 which is akin to his Scenario 3 – Return to the early church – but retaining, with some sort of building, a visible presence in the community. Such a physical presence could also be relevant in the event of Scenario 2 – Secular Welfare. With the potential introduction of “contestability” for Government services (compare the current tendering of government services such as School Chaplains and employment services), the Uniting Church could lose its access to Government funding. In that case the provision of community services could be thrown back on the congregations in the way it was to some extent before centralisation took place into Uniting Care. I post here my article describing briefly a Suter-type Scenario 5. Dr Keith Suter in his work The Future of the Uniting Church in Australia has outlined four scenarios as to where the UCA might be heading in the coming decades. He does not select one scenario over another as the most desirable or the most likely to be attained. “Preferred”, is the term he uses for such a choice, if it is made. For the purpose of using these scenarios to develop policies and move forward one needs to either select one of these scenarios, each of which has significantly different outcomes, or develop a scenario of one’s own. Milpara is moving towards this. This is Scenario 3 – Return to the Early Church. Scenario 5 – Milpara. A (local geographic) community spiritual centre and meeting place. It would comprise a slow but steady interpretation of doctrine in tune with educated social attitudes accompanied by visible interaction with the community at the local geographic level. Moving towards the incorporation of all faith positions, including the secular, as the spiritual, ethical, social heart of local communities. Clear identification in the early stages with the Uniting Church but with loose levels of governmental control maintaining the levels of church councils broadly along the lines of the present. The local community may be defined loosely as comprising those citizens within walking distance of the congregation or faith community wherever it may happen to meet. Remember this is a possible scenario, not a prediction of what might actually happen or is likely to happen. Delineating such a scenario, (I presume this is what Keith Suter is getting at) has a very practical value because, by adopting a scenario, this will colour and guide the decisions which are made and acted upon at all levels of the church. I don’t think such scenarios are necessarily wishful thinking or, by contrast, giving up. They provide guidance and a direction in which to channel our energies. And, of course one can have several different scenarios operating in parallel. One of the main differences Milpara has with Suter’s number Three is the low place he gives to a visible location of the church in the community. He does talk of “house churches” and that may well be a welcome part of it. But the dependence on coffee houses, private homes and other ephemeral rented locations for religious practice and community activity is unlikely to give a sense of permanence for the church group in that community. Moreover, if there is no physical base, it makes it that much more difficult to engage in social welfare by members of the faith group (as opposed to Government agencies or the centralised denomination) Nevertheless, we would see such a presence, not being envisioned by the grandly prominent church structures of past eras, but by “meeting houses” needing to occupy no more than a standard house allotment. Of course if the functions of a particular congregation were to expand and the secular community were supportive, more substantial buildings would be warranted. Place of denominational administration: (Assembly, Synod and Presbytery) We would see the National Assembly playing much the same role as at present, setting such policies as need to be defined and responding to questions of national and international concern. Presbyteries, which can be seen currently by congregations to operate mainly as a controlling body (monitoring “compliance”) rather than nurturing spontaneous growth, may become less necessary with a loosening up of control and church membership. Any necessary remaining presbytery roles might be taken over by the regional Synods. The Synods (regional coordinating bodies – not necessarily defined by State political boundaries) would have an additional role, of providing hands-on services for the small congregations and faith communities. This could include, financial accounting, property maintenance, centralised educational and training facilities and the provision of a pool of preachers and teachers. We anticipate that the funding of these would be provided by a levy (hopefully voluntary rather than required) on the faith groups. Currently only 30 per cent of Synod income at present comes from “offerings” as against indirect Government largesse of some 70 per cent. To summarise: Rather than a central body venturing out to plant what amounts to fully grown churches Milpara would seek to identify growth points from within the local community (perhaps from existing small home study groups) and nurture their growth. The new Highfields U.C. group may provide something of a model here. Our vision might be: “A church in every town and every suburb”. This entry was posted in Commentary on January 4, 2016 by Coordinator. I presume such market days are a feature of church congregations around the world. While I was holidaying on the Sunshine Coast last week we read of one being conducted that weekend by the Coolum Uniting Church. So what can this mean for those of us who seek integration of congregation and local community? At the very least it gives us chance to meet more of our neighbours. A local market on the church grounds can have a number of functions. It may be a means of raising money, often for charitable purpose, or perhaps for some immediate need for maintenance of the property. In the case of the Milpara Congregation it was for the purpose for getting rid of the clutter from all the paraphernalia which had built up in the storerooms and cupboards over a number of years. These reasons have their value. But what if, in the context of the Milpara vision we see these public occasions as opportunities to invite the local community to join with us in making our town or suburb a better place – a little corner of the Kingdom of God? Plan well ahead and draw up a schedule of market days as much as a year in advance and provide firm dates. As with the local government kerbside pick-ups this allows people to put aside items they may want to dispose of but which may still have value for others, knowing that they will have the opportunity to sell them or give them away. Be aware of government and denominational statutory requirements. This would include appropriate insurance cover. Church Councils will need to have the planned dates recorded in their minutes as activities of that congregation. With the awareness of the ageing and infirmity of most congregations, on top of the need to incorporate local “secular” expertise, be always on the lookout to invite non-attenders to participate and to have them, as far as is practicable participate in the initiation, planning, design and administration of the markets. It would be a good idea to invite people to attend church council meetings for that purpose. Such a practice would have the further purpose of demonstrating to the locals how church governance works. A non-member over a member*. As the purpose of the market is to bring church and community together the money-making aspect can be subordinated to the bringing of local people on to the property. Therefore sites for stalls may be offered at very cheap rates or free of charge. While the market is being conducted the church building may be left open for people to wander through and gain a little familiarity with the religious environment. Publicity. Because the aim of the market day is to build up rapport with the local community, promotion and advertising needs to be directed to people in the vicinity of the church property. Ideally this would be for people within walking distance. Use of local shop fronts, newspapers, community organisations and so on may be useful but the most direct contact with people is likely to be either greeting them in the street or through a publicity brochure dropped into letter boxes of every household. I suggest an appropriate radius for this would be a distance of one to two kilometres from the property. Glossary:* Members: In this context and in other places on the Milpara website “members” will not necessarily refer to formal, baptised members of the congregation (something which is not always easy to establish and a criterion not likely to be familiar to the general public). It will usually be used as a synonym for “regular attenders of worship services”. That is those people, whom to the casual eye, make up the group that forms a congregation. This entry was posted in Congregation - Community Integration - Tips on November 30, 2015 by Coordinator. Everybody knows who I am! For many years I resisted the idea of wearing a name badge on my chest at church services or other public gatherings. Perhaps I was a bit shy about revealing my identity. Perhaps I thought it to be something of an ego trip and that I would be just big-noting myself. I have now changed my mind when it comes to church services or to public gatherings where there are strangers. Perhaps it has become even more important when there are very few strangers who may feel somewhat isolated within a group of others well-known to me. The trouble with assuming that everybody knows us when it comes to integrating church and community, or simply making strangers welcome, is that we are seeing the question from our own point of view. What about the stranger, especially one who is coping with growing deafness? She or he is feeling uneasy about being in an unfamiliar environment. Being enabled to learn somebody’s name without the embarrassment, potential discourtesy and perceived “forwardness” in asking for it, can go some way to making the stranger feel comfortable in that environment. And this need not only be in incorporation of brand new people. Sometimes it can take a very, very long time to get to know the names of people whom we may greet from week to week and yet never manage to put a label to the face. To my chagrin and shame this week I was told of the untimely death of a person connected from time to time with our congregation. I could not recognise the name but was staggered to find that he had been associated intermittently with us for the past 10 years! There is a most damaging implication from the declaration, “I don’t need a name badge because everybody knows who I am”. It reveals a mindset that assumes that the membership of the group is static and there is no expectation of new people coming along. So let’s not be shy of displaying our names when it is our hope to make people welcome. To have the name of our denomination or congregation on a badge may be additionally helpful but the more space available to make the lettering easily visible may also be an advantage. I am not the first male to feel some nervousness at misperceived intentions in staring intently at a lady’s breasts because of my unreliable vision. Badges are readily available from the Internet and probably other sources and in my case, recently, cost about $10 each. This entry was posted in Congregation - Community Integration - Tips on November 23, 2015 by Coordinator. This entry comprises the start of a proposed time-to-time series of descriptions of the story of a small church congregation seeking viability in integrating with its local community. For the sake of some confidentiality we shall name it the Milpara Congregation. The stories will be a composite of the experiences of a number of separate congregations but describe events and activities which actually happened. We invite viewers of this site to send in reports and comments on their own experiences in integrating church and local community. The Milpara Congregation is keen to continue the fellowship of its members and to maintain a Christian presence in its community. It recognises, however, that with the ageing of its members (average age in the area of 60 years) the drain on their energy and likelihood of insufficient financial backing to maintain a full-time minister, it needs to have a serious look at planning for a way forward. One of the members suggested the formation of a small cell of committed people to plan for the future with a vision as far as the next 10 years – Committee 2025. The first meeting was held this week in a relaxed two-hour session over lunch. There was an encouraging attendance of six people. There had been no expectations, of making decisions on the day. In fact the aim was just to encourage participants to make a list of ideas, no matter how wild and woolly or impracticable they might seem. Following this meeting they were to seek ideas of other people as well and then, given a 10-year perspective, take time in selecting suggestions and throwing them open for the congregation to discuss and in due course perhaps take action. It turned out, however, that the results did not get that far. All seemed to agree that the world at large, whom we would hope to attract to the Jesus way, are largely ignorant about what Christianity means and illiterate when it comes to interpreting the Bible. Strong contrasts arose, however, as to how to respond to this environment. The main difference on the surface (although there are other deeper implications) was in relation to the value of facing newcomers with our traditional religious practices in activities other than worship services. Such religious practice would include prayer, hymns and preaching, Bible reading and the use of religious language – “God-talk”. One side reckon that we would not be true to ourselves or demonstrating to the people in the street what Christianity was all about, unless we required people to accept these religious practices when non-members were associated with us, even when not in the context of a service of worship. The other side, see public religious practice as not being at the heart of the gospel. To them compassion, forgiveness and loving one’s enemies is closer to the spirit of Jesus. In a world biblically illiterate and unfamiliar with the essence of Christianity, religious practice can inhibit or even repel people whom we wish to associate with us. An instance is recalled whereby one member on a “secular” walking-group excursion insisted on saying a “Grace” before meals. The other members of the group were offended by this. There is a need to work around these difference in finding policies and practices which are attractive to people outside the church so that we can draw them to Jesus. Until we have a clearer vision of the way we see expression of our faith in the future, we are going to find it hard to agree on what practical steps to take. It can be said that in seeking to bring the local community to freely interchange with its church congregation Milpara favours the second approach. As long as it does not compromise the principle of love we may actually reinforce that key principle by not insisting on our own religious practices but by “doing what the Romans do”. So, although this Committee 2025 did not make any firm decision for action and the way forward may be more of a struggle than might have been hoped, there was unanimous agreement that there should be more of this relaxed analytical discussion – with or without the lunch – and it was agreed to carry on with it in 2016. This entry was posted in Congregation Diary on November 15, 2015 by Coordinator. “Our Church is on life support” was one of the themes of the 2014 Uniting Church Synod in Queensland. So it is now recognised, after perhaps some years of denial, that our denomination is in dire straits. Whether suggested steps to be taken have any significant influence on the drift remains to be seen and we would encourage and support the suggestions and activities which may arise in support of revitalisation. Our purpose in Milpara is somewhat narrower than this as we focus on the fate of existing congregations, especially small ones, and perhaps facilitate the establish of new congregations or faith communities “in every town and suburb”. So, is our/your congregation, “to be or not to be” beyond the next ten years? I would suggest that this is an important question for those congregations which are of moderate size (20 to 100 attenders) and have not seriously faced this question. Sometimes the very small groups of less than 20 members have a surprising tenacity especially in some rural areas. They have learned to get by without a full-time minister. The large congregations of which there are very few in Queensland can manage to support a band of full-time professional staff. The most endangered are those which our current model tends to set up as the standard. That is a moderate-sized congregation with the capacity to employ one full time minister. More and more congregations are struggling to find the resources to do this. Milpara would see it as being necessary for the sake of survival for communities with small attendance to develop policies which would allow them to operate without a full-time minister, or no minister at all, if necessary. This still leaves them with the opportunity to grow to a size whereby employment of minister becomes practicable. One estimate used by the Presbyteries is that the maintaining of a full-time professional ministry requires and annual income of $120,000 per year. But is this acceptance of a stage of “struggle for survival” helpful or appropriate? Some leaders I have spoken with suggest it is too negative and uninspiring. People need to be given hope and assurance that they are doing the best they can. By focusing on survival this may take away the incentive to do the good things that congregation continue to promote and carry on in our local communities. 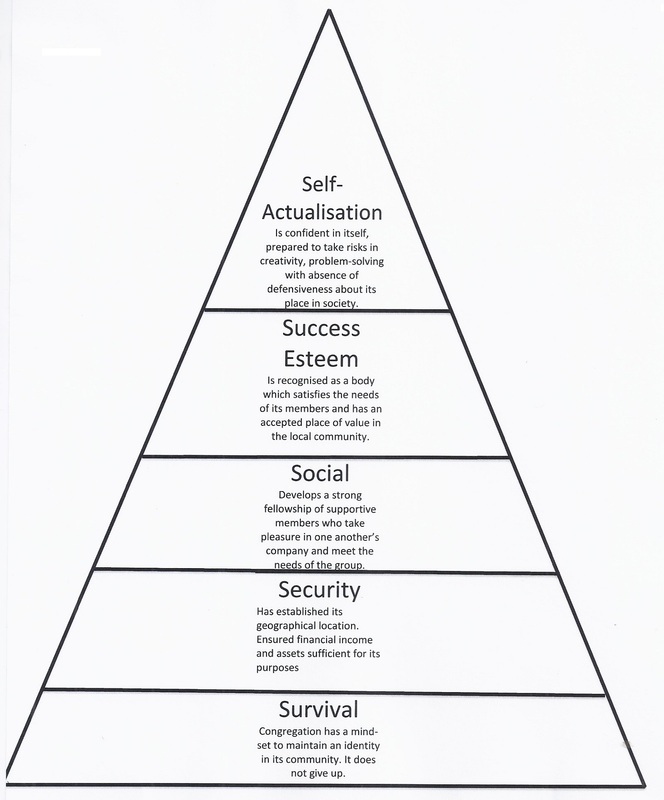 Nevertheless, find the model used by psychologist Maslow to classify human needs, as helpful in developing a way forward. He drew a model which suggested rising levels from the first desperate need, that of survival. He also suggested that although individuals could move up and down from level to level depending on circumstances there was a tendency for people not to be able to move to the “higher” levels until those at the lower levels had been satisfied. The following is a suggestion has to how this model might apply to a church congregation or faith community. This entry was posted in Congregation - Community Integration - Tips on November 8, 2015 by Coordinator. It so happened this month that, with one or two people having become aware of our Milpara vision of integrating churches with their local communities I was approached by Rohan Salmond, the Editor of UCA Queensland’s Journey magazine. He was writing an article on church planting and it was thought that with our thrust on nurturing existing congregations Milpara might have a contribution to make. “New shoots from root stock. A renewed focus on church planting may leave established churches feeling left out. Not everybody can start over in a new suburb, and traditional congregations also have communities to which they need to minister. But another project is already underway to revitalise older congregations. Rodney Eivers from Acacia Ridge Uniting Church is part of the Milpara Project, developed to assist local congregations to become integrated with their local communities. “I’m not talking about the church doing things in the community, “says Rodney. “I mean you hear stories of that in Journey and so on all the time. “I’m talking about the community getting involved in the church, right? Coming from the other direction so the community actually comes to feel that the church belongs to them, and they will work to support it. Milpara invites visitors of this site to send in their experiences in supporting the viability of small congregations and instances where they have earned the support of their local secular community. In awaiting your responses, however, it has been suggested that I relate the moderate success my own congregation Acacia Ridge Uniting Church has achieved in maintaining and increasing its vitality since its low point some 15 years ago. I’ll spread this discussion over the coming weeks and we shall welcome your responses as you seek to either bring new life back into your congregation or faith community or seek to discover the seeds of an interest in spiritual and social concerns which might lead to the formation of a new faith community in your local area. At the technical level please bear with me as I develop some familiarity with the management of this Milpara website. This entry was posted in Congregation - Community Integration - Tips on November 1, 2015 by Coordinator. paulinglis on What might the new face of the church look like? Rodney Eivers on What might the new face of the church look like?